The January issue of Il-Ħajja f’Għawdex is just out with its characteristic variety of articles related to everything Gozitan. 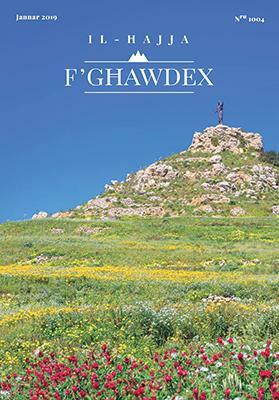 This issue is the first in full colour and this asset isskilfully exploited especially in the cover, showing the hilltop figure of Christ the Saviour rising above an argosy of winter colours gracing the Gozitan countryside. The diocesan chronicles reveal an incredibly active Church in all spheres of society, while we can also read, among others, scholarly articles on the linguisting features of the Gozitan dialect, herbal medicine and invasive flora and fauna found in Gozo. In terms of history, what stands out is a sober article on the greatest single tragic event in Maltese history, which stole away 23 Gozitan victims in one fell swoop. The photo of the month shows a postcard showing Mġarr Harbour published in around 1900.